I shared results last week for the insert benchmark. The test server for that result had fast SSD courtesy of several NVMe NAND flash devices. I repeated tests on a server with slower SSD and the results are interesting. Regardless of the storage device, MyRocks did better when the database was larger than RAM and InnoDB 5.7.10 did better when the database fit in RAM. But the difference between MyRocks and InnoDB 5.7.10 for the in memory workload is much smaller on slow SSD than it is on fast SSD. It is always risky to ignore the context from benchmark results and the important context here is the performance of the storage device. 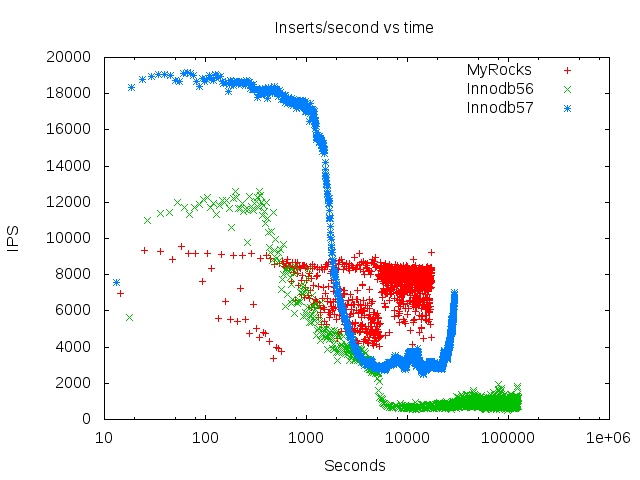 Slower SSD hurts InnoDB more than it hurts MyRocks because MyRocks is more efficient for writes. Spending less IO on writes saves IO to do more writes or more reads as I previously demonstrated for Linkbench. When the database fits in RAM there are no reads from storage. But there are many writes to storage whether or not the database is larger than RAM and the insert benchmark workload is always IO heavy. From looking at PMP stacks InnoDB throughput is limited by the rate at which the redo log is written and InnoDB in 5.6.26 has more CPU overhead from mutex contention than in 5.7.10. Note that the binlog was enabled but sync-on-commit was disabled so there was more stress on redo log throughput. The workload is fully described in my previous post. 500m rows are inserted for the in memory test and 2b rows for the larger than memory test. All tests use 16 clients, each client inserts to a different table and each table has 3 secondary indexes to maintain. The slower SSD provides about 10k page reads second versus more than 100k/second provided by the fast SSD server. Both servers have similar CPUs and RAM. By in memory I really mean that the database working set fits in memory but it is easier to ignore that and just claim the database fits in memory. Sorry for the confusion. InnoDB loses more throughput when going from fast to slow SSD and from in memory to larger than memory workloads. Restating the previous point, MyRocks throughput is more stable when going from fast to slow SSD and from in memory to larger than memory workloads. the value for wKB/i for MyRocks is somewhat smaller than InnoDB for the in memory database and much smaller than InnoDB for the larger than memory database. I expected this. InnoDB in MySQL 5.7 is able to sustain higher IO rates than in 5.6 thanks to many performance improvements in InnoDB. Assuming the slow SSD saturates around 400 MB/s of IO, then writing less per insert for MyRocks means it gets more inserts/second when IO saturates. I haven't been sharing many performance results on my blog as I have been saving results for my conference talks. Later this year I expect to blog more and travel less. 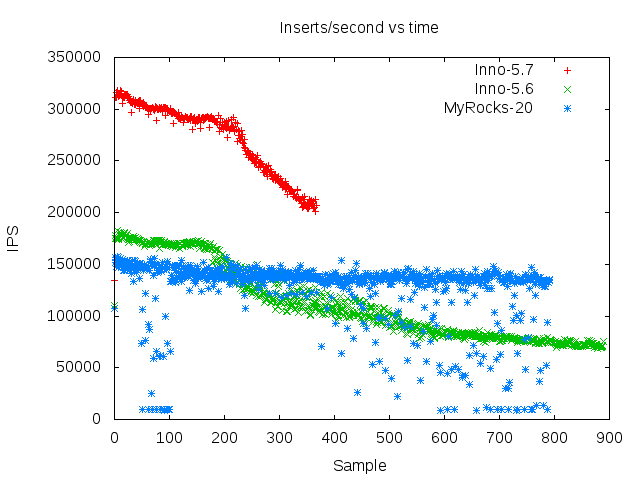 Today I will share two results from the insert benchmark to compare MyRocks and InnoDB. This test does inserts in PK order into a table with 3 secondary indexes. Without the secondary indexes the workload is friendly to a b-tree. But secondary index for a b-tree is read-modify-write and the reads from and writes to storage will make InnoDB slower when the working set doesn't fit into RAM. InnoDB is likely to do better than other b-trees because of the insert buffer. With MyRocks, non-unique secondary index maintenance is read-free so performance doesn't drop much when the working set no longer fits in RAM. I ran the insert benchmark using this script with two configurations. Both configurations used 16 clients, 16 tables and a client per table. For the io-bound configuration there was 50gb of RAM for the database and OS and 2B rows were inserted. For the in-memory configuration there was 256gb of RAM for the database and OS and all data was cached by the database cache. The test server has 48 cores with HT enabled and fast NVMe flash. For MyRocks I used the FB MySQL repo. For InnoDB I used MySQL 5.6.26 and 5.7.10. I tried to use a good my.cnf for all engines and the MyRocks settings are similar to what we suggest. For the io-bound configurations I used a 10gb RocksDB block cache and 35gb InnoDB buffer pool. For the in-memory configurations all database caches were set to 190gb. The binlog was enabled for all tests, but sync on commit was disabled for the database redo log & binlog. I disabled compression for all engines in this test. InnoDB still uses much more space on disk, probably because of fragmented leaf pages. The average insert rates for each configuration. 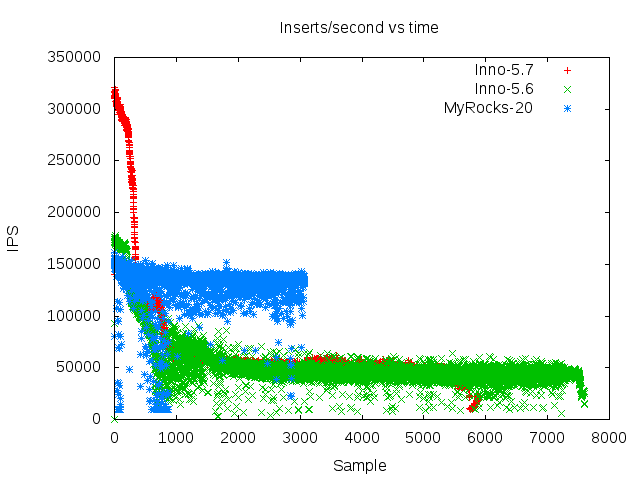 It is odd that the insert rate for io-bound MyRocks is better than for in-memory and I am not sure I will debug it. There isn't much difference between InnoDB from MySQL 5.6 and 5.7 for the io-bound configuration. There is a huge difference between them for the in-memory configuration. I assume the difference is all of the performance work done upstream (thank you). 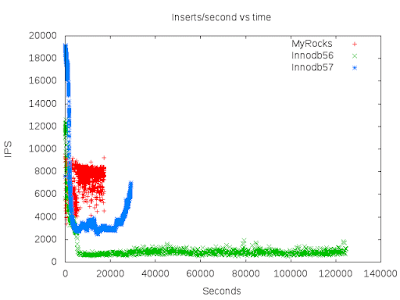 MyRocks is much faster than InnoDB for the io-bound configuration. InnoDB in MySQL 5.7 is much faster than MyRocks for the in-memory configuration. I expect MyRocks to do better on the in-memory setup in the future. I have two graphs to show the insert rates over time. This is for data from one of the 16 clients rather than the global rate because my test script forgot to collect that. The first graph uses log scale for the x-axis. The second graph does not. The first graph makes it easier to see how throughput drops for InnoDB as the database gets larger. While it is odd that the throughput rate for InnoDB 5.7 picks up at test end, that can occur if the thread I monitored ran longer than other threads and had less competition for HW resources near test end. The graph for MyRocks stops earlier than the InnoDB graphs because it finishes the insert of 2B rows much earlier. As a bonus for MyRocks, it writes about 1/4 the amount to storage per inserted row when compared to InnoDB. That makes SSD last longer and using less IO for writes saves more IO for reads. Percona Live 2017 is a great place to learn about MyRocks, MongoRocks and RocksDB. The MyRocks community continues to grow as one of the talks is from Alibaba. I am excited that they help make MyRocks better. MyRocks Deep Dive - a tutorial by Yoshinori Matsunobu. I continue to learn about MyRocks from him. This is a great way to learn about MyRocks. MyRocks: best practice at Alibaba - a talk by Jiayi Wang and Dengcheng He that explains the work by the Alibaba MySQL team to evaluate and improve MyRocks for a production workload. MariaRocks: MyRocks in MariaDB - a talk by Sergei Petrunia on the work to implement MyRocks and then merge it into MariaDB. If you want to know what it takes to connect MySQL to a new storage engine then Sergei is the person to ask. MyRocks Engineering: deploying a new MySQL storage engine to production at Facebook - a talk by Herman Lee on the effort to confirm that MyRocks is performant, correct and robust for production and then to make it easier to migrate from InnoDB to MyRocks at scale. An update on MyRocks - I will share updated results to explain when MyRocks is better or worse than InnoDB. Comparing MongoRocks, WiredTiger and mmapv1 for performance and efficiency - I will share updated results to explain when MongoRocks is better or worse than WiredTiger and mmapv1. AliSQL: breakthrough for the future - a talk by Wei Hu and Dengcheng He from Alibaba. They do creative work to help InnoDB keep up with demanding workloads. Vinyl: why we wrote our own write-optimized storage engine rather than choose RocksDB - a talk by Konstantin Osipov about a new write-optimized storage engine, Vinyl, that will allow Tarantool to be performant for greater-than-memory workloads. It is already performant for in-memory workloads. I am impressed by the project and look forward to innovation from them in this space.